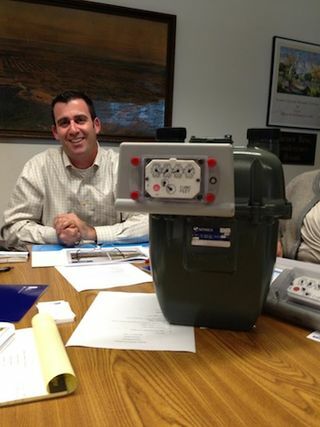 The Gas Co.'s Tony Tartaglia with an advanced meter mounted on a typical gas meter at the Altadena Chamber of Commerce last week. In a presentation to the Aladena Chamber of Commerce last week, Tony Tartaglia of the Southern California Gas Co. said that the utility’s employees will soon begin installing “advanced meters” to household gas meters in the Altadena area. There will be a similar presentation at tonight's Altadena Town Council meeting. While the new meters will look like the spinning dials that currently measure your household’s natural gas consumption, they will also transmit information on that consumption to a data collector unit (DCU). That data will go to the Gas Co., in part to determine your monthly bill. There are two units involved in advanced metering, Tartaglia said: the advance meter itself, and the DCU. The advanced meter goes on your home gas meter and measures gas consumption in the traditional way. It transmits data on your usage four times a day. Tartaglia said that the advanced meter is “off” most of the time, only operating about two minutes per year total. Power is supplied by two AA-sized batteries. The meter also doesn’t change the functionality of your gas meter: gas cannot be turned on or off remotely. Along with the advanced meters, the Gas Co. will also install 4,000 DCUs in its service area. Four of these will be in Altadena. The DCUs will be mounted on poles, 24 feet or higher, and are powered by solar panels. Tartaglia said that the poles will be matched to the neighborhood: if there are wood utlitiy poles, the DCU pole will be wood. If there are concrete or composite poles, such as street lights use, then the DCU will be mounted on a matching pole. In figures provided by the Gas Co., the maximum radio frequency exposure to an advanced meter is far less than of other household devices -- talking on a cell phone can expose a resident to up to a million times more RF than an advanced meter. An electric smart meter, such as are used in most homes today, exposes residents to 500 times more radiation than an advanced meter. Locations for the DCUs have been scoped out at about the 200 block of W. Harriet St., on the “peninsula” between Coolidge Avenue and Altadena Drive, on about the 1200 block of Echo Canyon Drive, and on the 3400 block of Lincoln Avenue. The Gas Co. says that the advanced meters will keep 1,000 vehicles off the streets every day. The technology will aso mean that customers can check their usage through a website. More information and fact sheets are available at http://www.socalgas.com/innovation/advanced-meter/.